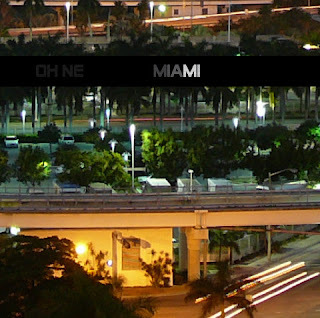 RAMIN TON: RTN009: Oh Ne "Miami"
Oh Ne released an E.P. consisting of a jam session they did on their trip to MIAMI, FL (United States of their dreams) last month. 3 Tracks. The main song is the almost 17 minutes long jam "Miami" that has been cut to some kind of rock song called "Miami Auslegware" from which then again the song "Oder Erinnerung von Miami" has been made. A reduced version of "Miami Auslegware". All this is part of the concept for the record which explains itself by reading its listening advice (you can find it on the download page).